What are the rovers up to? 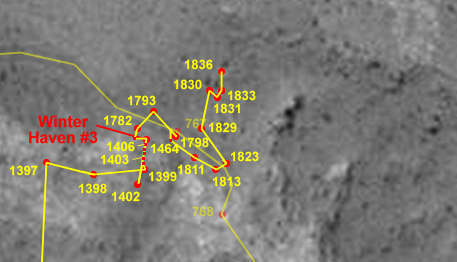 As of sol 1,833 (February 27, 2009), Spirit's drivers were attempting to steer it around Home Plate toward the destinations of Von Braun and Goddard to the south. Several attempts were made to ascend to the top of Home Plate, where the driving would be easy, but Spirit had run in to soft sand that proved too difficult to climb. 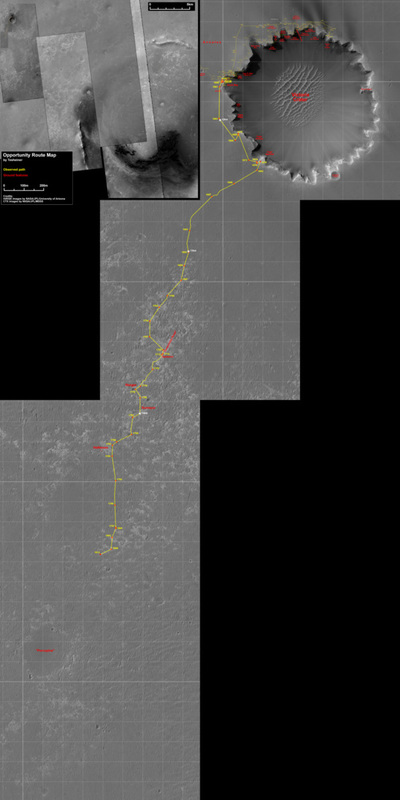 According to a press release issued by JPL today, after two attempts, they have formally given up on their attempt to ascend Home Plate and have decided to take the eastern route around it to Von Braun and Goddard. And then there's Opportunity, which has been bombing along among the Meridiani dunes. In fact, they've driven so much so fast that they've triggered a recurring problem in the right front wheel; now they have to alternate driving forward with driving backward in order to redistribute the lubricant in that wheel. This has, in the past, been shown to repair the uneven lubricant distribution problem. Unfortunately, Opportunity can't use its "D-star" autonavigation capability while driving backwards. Why? Because the autonavigation software requires the stereo imaging capability of the Navcam cameras. The Navcams have a clear view when the rover's driving forward, but while driving backward, the tall stick of the low-gain antenna pokes significantly into the Navcams' field of view, making it impossible to use the software. (Thanks to Paolo for the explanation.) So Opportunity will still be doing long drives, but with less use of the autonav capability it won't be able to match the high driving rates it achieved last month. Still, there's plenty of progress to show on the route map! You can see the transition from long drives to less-long drives around sol 1800. In recent weeks Opportunity has routinely clocked more than 100 meters on single driving days as it continues to the south-southwest on its journey to Endeavour. Rover drivers are following the trend of easily traversable bedrock flats among the dunes, and will turn east toward Endeavour when these run out. All of these maps are based upon the rover's own camera imagery and odometry. So it's a treat to get a reality check in the form of another of Mars Reconnaissance Orbiter's amazing photos of the rovers from space. This one shows Opportunity on sol 1,783, about a month ago, shortly after it had driven past two small craters that the team called Ranger and Surveyor. 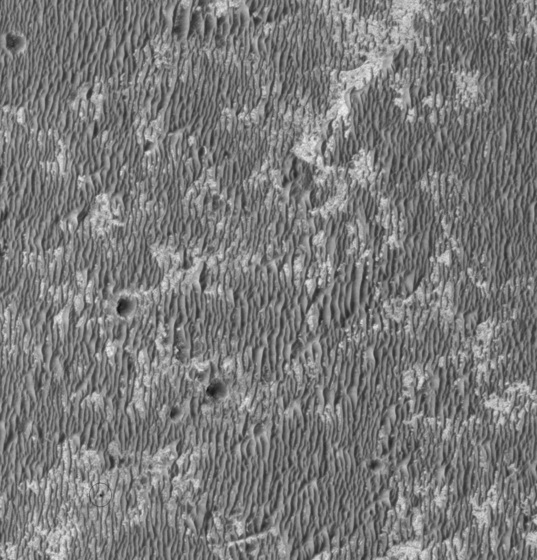 The HiRISE camera on Mars Reconnaissance Orbiter snapped a view of Opportunity during the rover's long trek from Victoria to Endeavour craters. The rover is circled at the lower left of the image. Opportunity looks so small among those dunes! It's driven so far, and it has so far to go. But it needs no water, or food, nothing but the Sun and a line of sight to Earth or Odyssey. It can keep going until the wheels fall off, as Steve Squyres (chief rover scientist) is fond of putting it. It's fun to try to trace the rover's tracks. They're pretty easy to spot for a few meters to the northeast of the rover, but after that (or, I guess I should say, before that, as we're tracing the tracks backward in time) the tracks run north-south, parallel to the dunes, and are much harder to pick out. I put some dots on the image where I think I see evidence of tracks but it could very well be wishful thinking on my part. I wonder how long those tracks are going to last. I think that evidence suggests the sand ripples aren't really moving anymore, but there's dust drifting around, and at the very least I expect the dark color of the tracks to fade with time, making them much harder to spot. 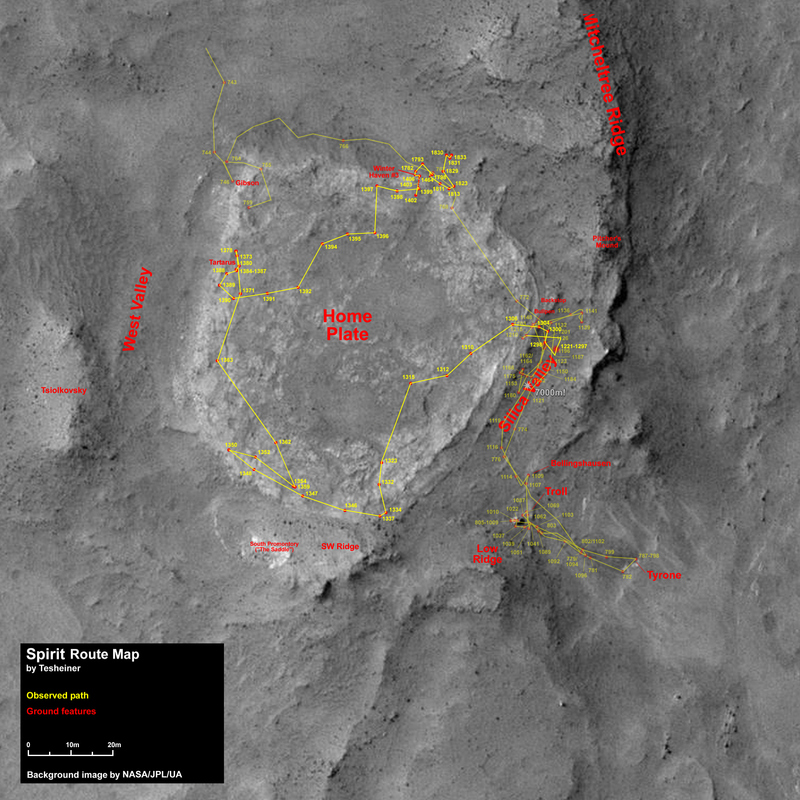 The yellow dots mark where I think I can see Opportunity's tracks in the January 29, 2009 HiRISE image of Opportunity.